The Italian scout cruiser Cesare Rossarol was a Poerio-class ship built at the Gio. Ansaldo & C. shipyard in Sestri Ponente. Entered into service on 1 August 1915, the Rossarol was actually a slender destroyer, 85m long and 8m wide. Her main armament comprised six cannons 102/45 and four torpedo launch tubes. With a displacement of 1,235 tons at full load, the Rossarol was able to reach a maximum speed of about 32 knots. During the First World War, the Rossarol successfully carried out several missions in the Upper and Lower Adriatic, taking part in various combat actions, laying down mines and escorting armored units. Her tragic loss came when the Great War was already over. At 11:40 a.m. on 16 November 1918, a few days after the signing of the Armistice that sanctioned the end of the war, the Rossarol dropped her moorings at the port of Pula in Croatia in order to transport a Serbian officer to Rijeka who was supposed to convince the Serbian-Croatian irregular forces not to oppose the Italian occupation of the city. After about an hour of navigating the sea, the ship hit a mine less than a mile from the coast, at the mouth of the harbour to the town of Lisignano, and the violent explosion broke the hull into two. According to witnesses at the time, the Rossarol sank quickly. The stern reared upright in the water before sinking, while the prow continued to drift until it finally disappeared, swiftly swallowed by the waves. In the sinking, 100 men perished, including seven officers, as well as 93 non-commissioned officers and sailors, including the the captain and commander of the vessel, Ludovico De Filippi, who was born in 1872 in Turin and decorated with the Silver Medal for Military Valor (Medaglia d’Argento al Valor Militare). Only 34 men managed to survive the sinking, rescued by other naval units. Today, the wreck of the Rossarol rests on the sea floor at a depth of 49m. The stern, about 50m long, is tilted to one side, while the forward section is 336m away in an inverted position. Since 2014, divers of Global Underwater Explorers (GUE), in collaboration with Maurizio Grbac of Krnica Dive Center, have been carrying out a historical, cultural and scientific project on this wreck. The project—which is supported by Santi Diving Equipment, Tecline Diving and K01—has several objectives, including bringing the historical event to light, studying the location of the wreck, and safeguarding its state of conservation. The results of the project were presented on 4 September 2018, as part of a press event in Krnica that hosted representatives from Austria, Finland, Germany, Italy, Norway and Sweden. The event was organized by the Tourism Agency of Istria and the Altum Mare association of dive centers, in collaboration with the Croatian National Tourist Board, the Lisignano Tourist Office, the Diving Network Ltd. and the Krnica Dive Center. Unveiled at the event was a new website dedicated to the shipwreck (Rossarol.krnica.com). Here, one can find historical information, underwater images and annual reports about the wreck and the project, as well as 3D reconstruction models of the two parts of the wreck. Since the beginning of 2018, Istrian institutions have been keen to raise public awareness of the Rossarol affair, organizing a series of events marking the centenary of the shipwreck. 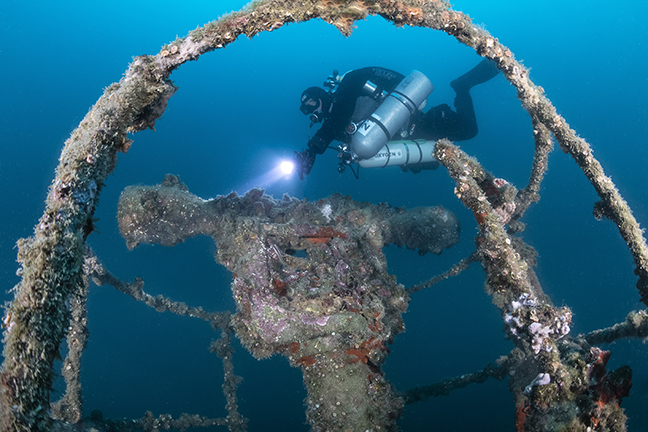 In addition, there was no lack of commemorative dives to the wreck, one of which saw several GUE divers from the Netherlands, Germany, Italy and the Czech Republic placing a plaque near the wreck. The day of the dive to place the plaque began with a briefing held by project leader, Jeroen Veltrop, who illustrated the procedures for connecting the stainless-steel plate to a concrete base, which had been placed on the sea bottom at the wreck site the day before. At the end of the Veltrop’s briefing, the team—which included Peter Zaal, Berry van Leeuwen, Mathijs Geenen, Barend de Lange, Nicole Heuer, Joseph Chroust, Giovanni Grieco and Luca Palezza—performed the dive, with underwater photographic documentation of the event captured by Alex Dawson and Marcello Di Francesco.